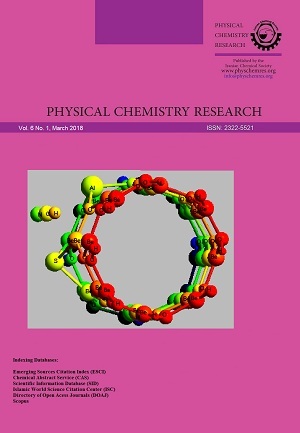 In this research, the interaction of pyrimidine molecule with pristine B12N12 nanocluster is studied in different phases to understand the effect of environment on the electronic properties of the designated adsorption complexes. To this end, the pyrimidine adsorption over B12N12 in the gas phase and water medium is investigated using density functional theory (DFT) at the B97D/6-31+G(d,p) level of theory. Geometry and electronic structures of the fragments and their interacting systems are studied, and then natural bond orbitals (NBO) analysis is applied to interpret the perturbation caused by molecular adsorption. 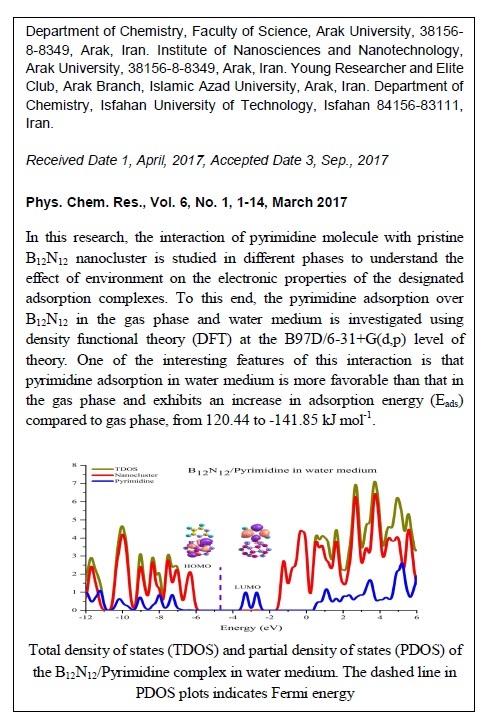 Our results confirm a chemical adsorption between pyrimidine molecule and exterior surface of pristine B12N12 One of the interesting features of this interaction is that pyrimidine adsorption in water medium is more favorable than that in the gas phase and exhibits an increase in adsorption energy (Eads) compared to gas phase, from 120.44 to -141.85 kJ/mol. It is hoped that pristine B12N12 will be used in designing novel materials for potential applications to detect pyrimidine molecule in the gas phase and water medium.